A prayer book said to have been used by Bonnie Prince Charlie at the battle of Culloden. A prayer book said to have been used by Bonnie Prince Charlie at the battle of Culloden has been donated to a Highland museum. The prayer book, titled ‘Manual of a Christian’, was said to have been presented by the prince on the battlefield to Captain James MacDonnell. It has been gifted to the West Highland Museum in Fort William by a descendent of the captain. The inscription was added in the early 19th century when the book was rebound by the above named James Charles Gordon, whose own father, grandfather and great grandfather had all been at Culloden. The Very Revd Canon Donald Carmichael inherited the book in the 19th century. In May 1888 he wrote a memorandum based on a discussion with his sister Jessie MacDonald. According to their testimony, the prince had indeed gifted the prayer book to James MacDonell of Glengarry, who was a captain in the prince’s army, and aged only 16 years old at the time of Culloden. 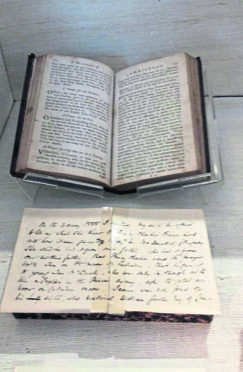 The prayer book is currently on display in the museum alongside the Faery Pipes of Moidart, said to be the oldest set of bagpipes in existence. The battle of Culloden was the last ever pitched battle to be fought on British soil and took place on April 16 1746 on the famous moor overlooking Inverness. The Jacobites, under Charles Edward, the Young Pretender, were defeated by British forces under William Augustus, Duke of Cumberland. The battle, which lasted only 40 minutes, resulted in bitter defeat for the heavily outnumbered Jacobites and changed the course of British history.